What do you do with cabbage? Sometimes I use it in winter minestrone soup, but not always. And I like to make a cabbage salad for spicy chicken sandwiches: pounded and breadcrumb-coated boneless chicken thighs fried in shallow oil, on a bun (not too crusty, not too soft) with chili-garlic sauce and a whisper of mayonnaise. And before adding the lid, I add a pile of cabbage with vinegary dressing. Imagine the sandwich assembly: hot chicken on the bottom bun topped with chili-garlic sauce waiting on the plate; then add a heap of cool, crispy salad (cabbage, carrot, parsley) so it actually piles high and falls off the sides of the bun onto the plate. Now the top bun, already spread very thinly with the mayo. Next time I may add a handful of plain potato chips on the side of the sandwich. When I make nachos or tacos I like the same crisp salad; I usually add onion, and iceberg lettuce. 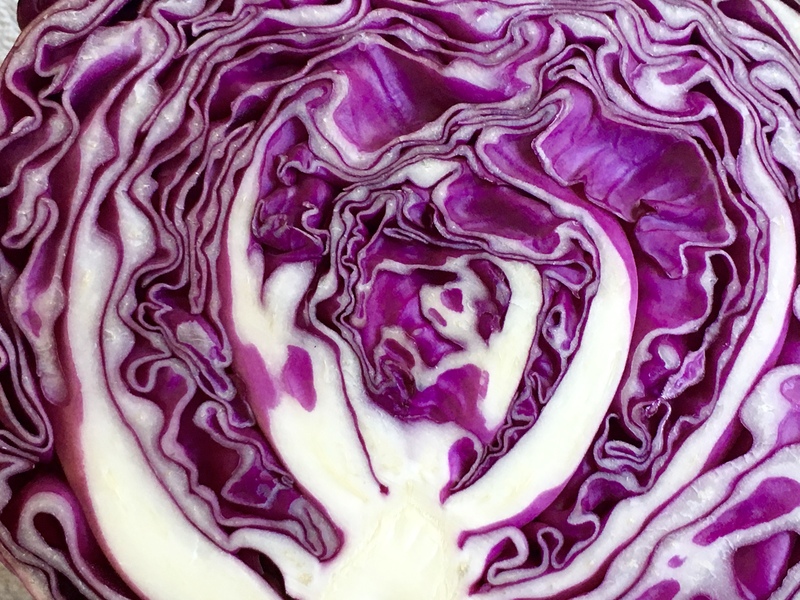 I think that cabbage, especially red cabbage, looks so beautiful when you cut into it, but usually cannot find enough ways to use it all. This week the leftover cabbage salad got used up in fish tacos (all leftovers) for lunch and as a new salad with arugula and strawberries added in with fresh pepper. But just the salad, not the rest of the head. What else do you do with cabbage?